Few would categorize preservation as disruption. The act of safeguarding structures that have been around for decades or centuries sooner implies the maintenance of an existing environment, while bulldozers are used to upend the status quo. But “Finding a Path Forward,” the newest theme study from the National Historic Landmarks (NHL) Program, posits that preservation can—and should—be a disruptive force. The 400-page study, five years in the making, was published in May 2018. It centers Asian American and Pacific Islander (AAPI) sites and stories throughout 18 essays edited and introduced by Dr. Franklin Odo, reimagining historical places to challenge norms so ingrained that they are largely invisible—chief among them the concept of America as empire. “Finding a Path Forward” joins the 2013 American Latino Heritage Theme Study and the 2016 LGBTQ Heritage Theme Study as the NHL Program’s most recent guidebook for inclusive preservation. Putting contemporary norms in their historic context can galvanize change. When the subject is marginalized communities in the American empire, that strategy becomes all the more radical. The first essay of the collection is Gary Y. Okihiro’s “Imperialism and Migration,” a fitting transition from Odo’s introduction, which is a rebuke of the colonial structures that continue to affect AAPI communities. 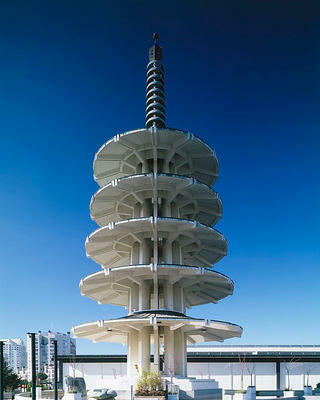 The 100-foot-tall Peace Pagoda in San Francisco, designed by Japanese architect Yoshiro Taniguchi. The second essay, Amy Stillman’s “A Sea of Islands: Early Foundations and Mobilities of Pacific Islanders,” continues the progressive approach to place-based history, excavating specifically the heritage of Pacific Islanders, folks too often overlooked by the AAPI community that claims them. Leading off the compilation together, these essays send a strong message to those who might be tempted to accept familiar narratives at the expense of telling the full story. To read the rest of this story, head to Preservation Leadership Forum, the network of preservation professionals brought together by the National Trust for Historic Preservation. Amy Guay is an Editorial Intern at the National Trust. An American Studies major at Georgetown University, her research and writing focuses on Asian and Pacific Islander American history and heritage.